The United States Congress designated the Trinity Alps Wilderness (map) in 1984 and it now has a total of 537,363 acres. All of this wilderness is located in California and is managed by the Forest Service. Formerly known as the Salmon-Trinity Alps Primitive Area, the Trinity Alps Wilderness is located 50 miles west of Redding California. The area contains the Wild and Scenic Trinity River in the south and the Wild and Scenic Salmon River in the north. Numerous rushing streams feed into these rivers, many of them emerging from the region's 55 lakes. Scattered stands of timber, most of them virgin, are opened by large meadows with wildflowers in July and August, and shadowed by barren rock cliffs and stark peaks with elevations up to 9,000 feet. Black bears are common (despite the name, they're often colored brown or blond), sharing the area with an abundance of other wildlife species. As much as 12 feet of snow falls on the high country every year. Currently the entire Wilderness (one of the state's largest) is situated on, and managed solely by, the USFS. 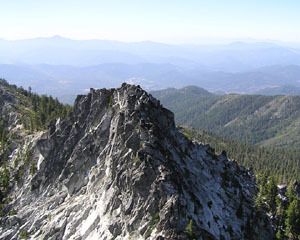 The Trinity Alps Wilderness contains a total of 550 miles of maintained trails. Numerous loop hikes are available, requiring three to five days to complete. Seventeen miles of the Pacific Crest Trail run through the northern part of the wilderness. There are many areas within the wilderness capable of providing opportunities for solitude. Planning to Visit the Trinity Alps Wilderness? How to follow the seven standard Leave No Trace principles differs in different parts of the country (desert vs. Rocky Mountains). Click on any of the principles listed below to learn more about how they apply in the Trinity Alps Wilderness.